Blood Clan… all 3 books in ONE! I have been waiting FOREVER to share this news with you! 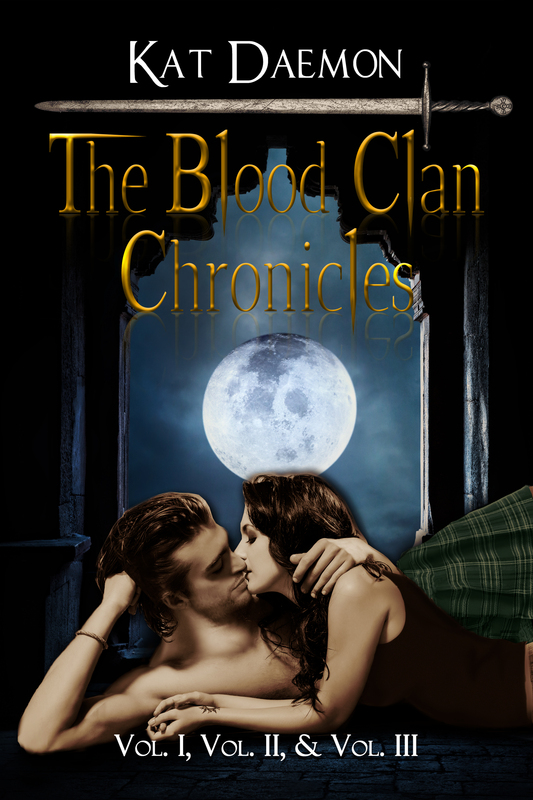 THE BLOOD CLAN CHRONICLES is now ONE BOOK! That’s right, all three novellas have shifted into one full length novel with one hell of a new fang-tastic cover! Here it is, another gem created by the amazing Sotia Lazu! I am so in love with this cover. From Tori’s tattoo, to Bryce’s clan kilt I couldn’t be happier. I can’t wait to hold it! That’s right! The Blood Clan Chronicles will be available in PAPERBACK as well as digital! And there’s more… as well as being completely revised this version also has a special treat! A sneak peek at A Crown of Flames book one of my new series. These projects have been a labor of love and I am so happy to finally share all the good news with you guys! The Blood Clan Chronicles officially releases everywhere August 7, 2015. But you can pre-order the digital version now! It’s selling at an introductory rate of $1.99, but unlike my vamps, that price will NOT last forever! A phone call a decade in the making. Sotia Lazu on What I do all day.